SNHR said today that no less than 11 massacres perpetrated by the parties to the conflict in Syria were documented in the month of May. The report records a notable drop in toll of massacres in Syria for a second month in a raw. May saw a number of agreements that resulted in Syrian regime forces, backed by Russia, completely seizing control of south Damascus, as well as areas in northern suburbs of Homs governorate. The residents of those areas were forcibly displaced to north Syria. In the wake of those agreement, rates of bombardments by Syrian-Russian alliance forces have notably dropped in most areas, which, in turn, reflected on the civilian death toll and massacres against civilians. Rates of international coalition airstrikes in the eastern region of Syria, the report adds, have raised in May, particularly in southern suburbs of Hasaka governorate, as international coalition forces topped all parties in terms of massacres with five massacres, in which 60 civilians were killed. Of those, 80% were children and women. May also saw a notable increase in numbers of bombings and killings by the way of gunshot in most of the areas that aren’t under the control of Syrian regime forces. The report documents no less than 171 massacres that have been perpetrated by the parties to the conflict in Syria since the start of 2018. In addition, the report records no less than 11 massacres in May. The report uses the term “massacre” to refer to an incident in which five peaceful individuals are killed in the same attack. Based on this report, Syrian regime forces were responsible for three massacres in May, Russian forces were responsible for one massacre, and international coalition forces were responsible for five massacres. Lastly, two massacres were perpetrated by other parties. According to the victim documentation team at SNHR, these massacres resulted in the killing of 103 civilians, including 45 children and 28 women (adult female). This means that 71% of all victims were women and children, which is a considerably high percentage, and an indication that civilian residents were targeted in most of these massacres. 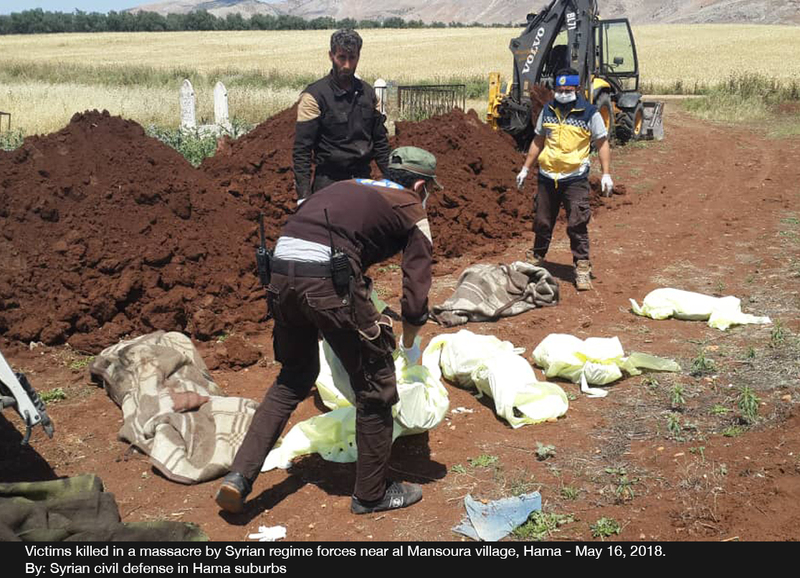 The report breaks down the death toll of May’s massacres, as 19 civilians, including nine children and six women by Syrian regime forces, while eight civilians (five children and three men) were killed in the massacre by Russian forces. The death toll of international coalition forces’ massacres amounted to 60 civilians, including 29 children and 19 women, while 16 civilians, including two children, were killed in the massacres perpetrated by other parties. The report adds that other parties carried out attacks that resulted in civilian deaths, confirming that these violations might constitute war crimes, but don’t qualify as crimes against humanity as with the Syrian regime and its pro-regime forces.